My mother's family grew up in Flat River just a short drive away. My Aunt sold us this property as she knew I needed to be close to the water. Every summer we have been down in Belle River enjoying the beach and making memories. When we built our cottage, first of all I kept it in the back of my mind to make it easy to clean, and it is. I wanted a cottage to rent out that would make the guest feel comfortable and at home and most of all bring back the simple things like doing puzzles, games and most of all having a wonderful vacation. I love sitting out on the deck with my lawn chair and just looking at the water and the land and just enjoying the peacefulness. Both bathrooms have a hair blower and travel size shampoo and conditioner. A beautiful short walk down to the beach. Full view of the Northumberland strait from our cottage and the quick walk down to the beach. Laundry soap and dryer sheets are not provided. There is also a stationary close line outside. Ice maker and water dispenser. We have a purification hooked up to our well so the water is great to drink. Pots and pans, waffle maker, bowls, baking sheets, toaster, lobster pot, plastic wear, blender, utensils etc. You can listen to all kinds of music on the television. What a view from the upstairs balcony! 1/2 hour away you can take a tour boat. There are tourist guides provided at the cottage. 10 minutes to the nearest golf course, but there are a lot more on the island. A delightful quiet spot with easy access to the rest of the island. Well supplied house, short walk to the beach. Being able to buy crab direct from the factory was a plus. Sofa in the living room beginning to lose its form, not too comfortable but there is a beautiful loft option to sit when not outside. A very quiet and relaxing spot to enjoy PEI anytime. Excellent stay at Dee's Dream. We were a family of 4 (2 teenagers) and a small dog. The cottage was impeccably clean with many extras to help you enjoy your stay. Outside the screened gazebo was enjoyed in the evening after a short walk to the beach where we were often the only people there. Our dog enjoyed the freedom of the cottage grounds and chasing birds on the beach. We enjoyed that Belle River was so peaceful yet we could easily drive to explore the rest of the island. We look forward to returning to PEI soon and would definitely stay here again. Thank you for the kind words and I am so happy that you and your family had a great time. It is very peaceful down in Belle River and with that you can have a nice relaxing vacation. "Close enough to everything and far enough away for peace and relaxation." It has been our pleasure booking Dee's Dream with your family and I hope our paths will cross again in the future. Amazing vacation. Fun for the whole family. I am so happy that you and your family had a wonderful vacation and stay at the cottage. It is the perfect spot for kids to go out and explore and find all kinds of treasures. I am so happy you went clam digging. I often wonder how many of our guest take the shovels out and go. Thank you for the kind words and best wishes to all! P.S Our dog Eddie also loves it. A comfortable, well stocked cottage in a lovely location! Really enjoyed our stay. It’s a nice property with a short walk to a really lovely beach. Beds are a tad softer than our norm but comfy. Thank you for the kind words and we are so happy you had a wonderful time! We also enjoy the walk down to the beach, it is very open and the view of the Northumberland Strait is just beautiful! This really does feel like a home, not a rental. There’s everything you could want as far as amenities - the kitchen is stocked with every kind of dish, utensil, pots, pans,glasses that you’ll need. The beds and furniture are so comfortable and the screened in gazebo an amazing place to eat all your meals. The view is breathtaking and all you hear are the bird and the crashing waves. I’ve stayed here before and plan on a return visit. We try our best to make everyone feel comfortable and at home staying at the cottage and most of all to be able to relax and enjoy their vacation. My favorite spot is sitting upstairs on the deck and just staring out at the water or reading a book. We are so glad that you had a great time and I am looking forward to speaking with you again. We were certainly not disappointed upon our arrival. This property is exactly as described, with all amenities you could ask for including a supply of paper products in kitchen and bathrooms! The place is spotless and beautifully decorated. It is has a huge lot with views of the Strait from each of the decks. We had a fantastic time in PEI and staying at Dee's dream was certainly a highlight! A big thank you for the kind words and we are very happy you had a nice stay! Located in Belle River only 45 min from historic Charlottetown and 8 min from the Wood Isles Ferry to Nova Scotia. 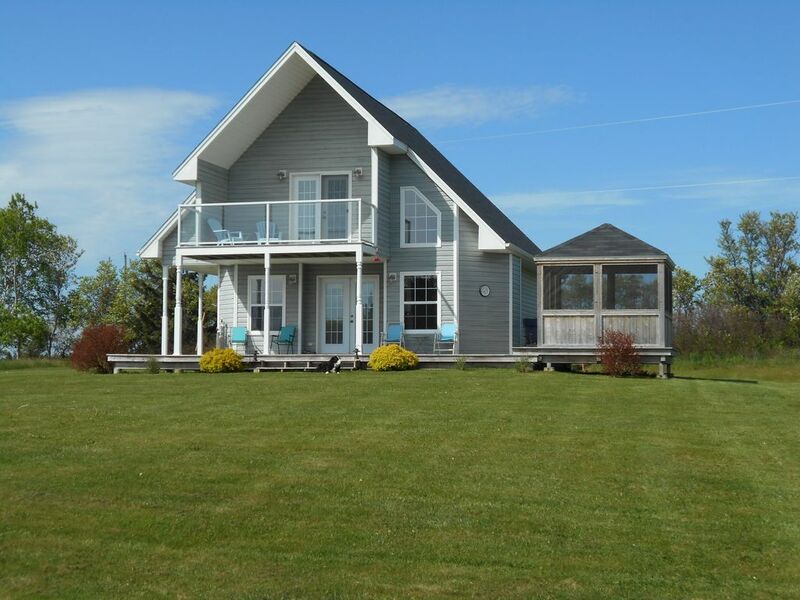 Dee's Dream is a newer build cottage with a breath taking view of the Northumberland Strait. Located on 1.5acre lot it has horse shoes, volleyball, fire pit and a gazebo to relax at night time. A quick walk down to the beach where you can enjoy all the south side has to offer. It is a treasure chest for all ages! Close enough to all attractions and also far enough to relax and enjoy the peace that surrounds you!